What an honor it was to attend one of the rehearsal nights for Up Theater’s production of Anna Theresa Cascio’s St. Peter’s Foot. I really enjoyed watching this piece take shape & then got to speak to the cast & creative team: James Bosley (Up Theater founder), Anna Theresa Cascio (playwright), Molly Fowler (Director), Doc Dougherty (“Mike”), & Laura Fois (“Roma”) about this fantastic theatre company & production. 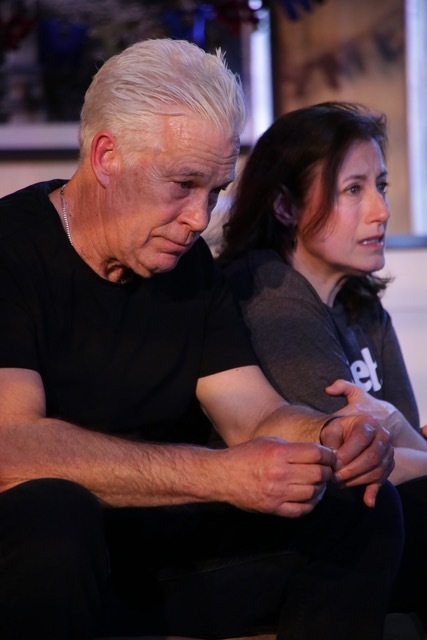 St. Peter’s Foot is a two-character play about “Mike” and “Roma,” a quirky middle- aged, self-absorbed, childless couple, who have no idea how hilariously miserable they are. On the eve of a long-planned trip to Italy, to scatter the ashes of “Roma's” deceased mother into the Po River, a gift is left at their door that causes them to question their marriage, their illusion of happiness, and their priorities. St. Peter’s Foot, written by Anna Theresa Cascio & directed by Molly Fowler, is currently at The Fellowship Hall at Ft. Washington Collegiate Church ( 729 W. 181st Street) through April 6. Click here for tickets! For more on Up Theater visit https://www.uptheater.org and follow them on Facebook & Twitter! 1. Why did you create Up Theater Company? So many theatre artists live up here in Washington Heights. We often have to spend an hour or so on the subway to go downtown or to Brooklyn to rehearse/attend theatre. We thought, “Why do we have to keep traveling to do what we love? We should be able to find someplace up here (Upper-Upper Manhattan) to work.” So we started our own theatre company. We just celebrated nine years of making theatre. We have put on 12 or 13 full productions. It’s a labor of art and love and community because the community really embraces us. They love the fact that there is a professional theatre company up here doing new, interesting productions. It’s a theatre for the community, but it’s not a community theatre. 2. How did you decide to do St. Peter’s Foot? I’ve known Anna Theresa Cascio (the playwright) for a long time. She has come to several of our shows and one day she told me she had a play and wanted to know if I were interested in reading it. I read it and I just fell in love with it. The dialogue is what attracted me first to the play. It’s very sharp. So smart & so true. Under that dialogue is a whole heartfelt painful kind of yearning. That also attracted me to the play because we all go through life yearning for something, but we can’t always put our finger on it. I think the moment in this play when the characters discover who they are & what they are really about is just beautiful. We did a reading of the play last year and it was very successful, so it was a no-brainer that this was going to be our next production. 3. You kind of touched upon this, but what’s something in the play that made you go, “I totally get that.” I think the whole first scene where the couple is bickering about the various problems that seem to be the weight of the world on them & then how insignificant those problems suddenly seem at a turn of events. But that’s what life is. We seem to have these daily problems that just weigh us down, but then a real problem comes along that puts everything into perspective. 4. How involved were you in the casting of the play? The actor in the play, Doc Dougherty, who plays “Mike,” has been involved with the play since the beginning, so he came with the play. For the role of “Roma,” we auditioned. As I said earlier, we try to use as many uptown talents as we can, but not always. We have to find the best people and do the best work. So we had about 10 women come in, all living in Washington Heights/Inwood & Laura Fois, who’s been a part of the company & done several plays with us, won the role. 5. In this show, “Mike” & “Roma” plan a trip to Rome. If you could kiss St. Peter’s Foot, what would you wish for? I would wish for a world where children were taken care of & didn’t have to be taken from their parents. And parents wouldn’t have to worry about having to flee someplace and risk themselves and their families and their children’s lives. I think that’s the most critical thing we are dealing with right now. 1. What attracted both of you to the show? Laura Fois: It's always fun to see a couple on stage go through things that you might actually relate to. This couple has been together a long time. They've come to a stasus in their relationship until this surprise comes into their lives. It's fun to see them come out of the stagnancy they've been in for too long. Doc Dougherty: Two words attracted me to this play: Flawed hero. Not so much with plays, but with TV & American movies, they give this illusion that heroes have to be perfect, and they are not. Laura Fois: People are much more interesting when they are flawed in general. Good is boring. 2. From watching part of your rehearsal I can tell you definitely have a good dynamic together. Your characters definitely seem to be set in their ways. As we mentioned, this couple gets a surprise event. So, how do you, in your own lives, with your respective partners, handle the unexpected when things seem to be flowing along just fine? Laura Fois: Hopefully the first thing is to look at each other and say "What are we going to do?" As an individual, if the change freaks me out, I try to ask myself, "Why does it freak me out? What is it about this situation that is scaring me?" I kind of go from there. Doc Dougherty: Let's just say that the real "Mike" & "Roma" have gone through some crazier things than the surprise event in this show. 3. What do you relate to about “Mike” and “Roma” the most? Doc Dougherty: I can relate to how much "Roma" is in love with "Mike." Laura Fois: I can relate to having to allow a big personality sometimes just let them be big, but at the end of the day, we're going to Rome. 4. What is one characteristic about each of your characters that you are glad you yourself do not possess? Laura Fois: I'm not an art snob. Doc Dougherty: I'm glad I'm not a fire man. 5. What do yo think audiences will relate to the most about the story? Laura Fois: I think there are a lot of people in relationships who are set in their ways and they start taking their partner for granted. 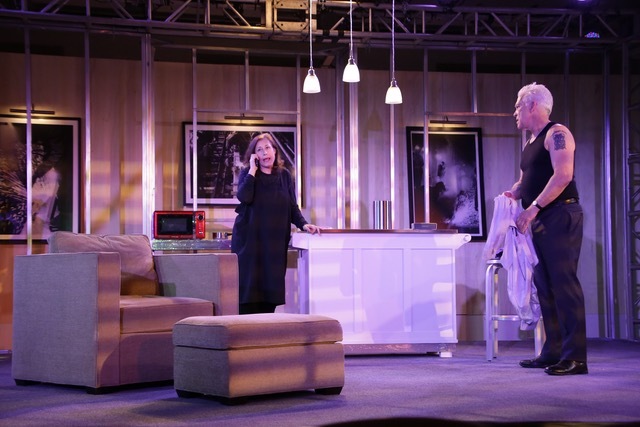 I think in this play, you really start to see "Mike" and "Roma" fall in love again and start to recognize why they fell in love with each other in the first place. 6. Since your characters are going to Rome, if you could kiss St. Peter’s Foot, what would you wish for? Doc Dougherty: I would wish the Jets would win a super bowl. Laura Fois: I would wish that we have a new government very soon. 1. Let’s start with Anna. How long did it take you to write the play? Anna Theresa Cascio: I think it probably took me a couple of months on and off because I had that beginning. It was real and that was my starting point. Then I had to find a story to fit it into. That took a while. I wanted the story to move very quickly. Over a period of several months, I honed it, took scenes out, put scenes in, but I always had the beginning & I always had the end. 2. Which was the easiest scene to write? Anna Theresa Cascio: The first scene. 3. What was the most difficult scene to write? Anna Theresa Cascio: The one right before the end because a lot of drama happens there, but I was very cognizant of not wanting the dialogue to be on the nose. I had to keep finding ways to veer from that. I had to keep going back to the beginning to make sure I had set up for this off-beat way that they deal with this extremely dramatic moment. 4. Molly, what made you want to direct this play? Molly Fowler: I’ve known Anna & her work since we were in college together. When I first met her, she had the quirkiest characters. My vocabulary probably increased by 50% just listening to her characters speak. I always had fun watching her plays, even when I realized, during one of her plays, that the woman on stage was the woman sitting behind me, and that was her mother. Anna has grown as a playwright, she has a real understanding of structure and this play is so disciplined in all of its madness. It’s a challenge, but it’s fun to watch this play get up on its feet. These two actors are a joy to watch. 5. Molly, did you know from the start that you would be directing? or Anna, did you write the play and then when you knew which company was going to mount it, is that how Molly you got involved? 6. Since you’ve had such a long history together as friends & colleagues, what’s the best part about working together & what’s one challenging part given your history & friendship? Molly Fowler: I've learned over the years how to ultimately get my way if I need to. But the truth is I don't really need to win because I really respect Anna as a writer. 7. If you could kiss St. Peter’s Foot, what would you wish for? Molly Fowler: World peace & a full house every night because I think this group is worth paying attention to. I didn't know there was a theatre company above 125th Street that had the kind of talent that has come our way at every turn. Up Theater has that. It's a real find. Anna Theresa Cascio: I think I would wish for the kind of harmony this couple has in the play by the time they get through all the drama.